It’s year-end forecast time. Following are the 12 technology trends that I think are critical for marketers to watch in 2012. These are the emerging customer behaviors, digital interfaces, social media, and marketing platforms that will transform the way customers connect with brands in the year ahead. At the same time that mobile is becoming our default standard, the definition of “mobile” is rapidly expanding. This is due to the broad popularity of tablets, which have spread from personal computing to business with use cases ranging from mobile sales forces to C-suite executives on the go. On the strength of the iPad, Apple is poised to become the largest computer manufacturer in the world in 2012. Meanwhile, Amazon’s Kindle Fire is blazing the trail for a wider market of stripped down tablets at a fraction of the price. Increasingly, brands will have to develop digital experiences for three screens: the smartphone, tablet, and personal computer. By 2012, QR codes (“quick response”) will have gone from “Too confusing, consumers don’t get it” to “Too new, the ROI is unclear” to “That’s old news, of course we have one on the corner of every brochure.” Meanwhile, innovative uses of augmented reality will continue to unfold in retail and gaming apps that merge on-screen reality with what’s in front of us off-screen. While the first iteration of Google Goggles has not caught on, visual search (or “true A.R.”) may start to make its first appearance in 2012, allowing us to point phones at random objects in the real world and find relevant online information about them. Starbucks’ mobile app has processed 26 million transactions in its first year, thanks to scanners on location in many stores. Kenyan mobile payment startup M-pesa now processes more transaction globally than Western Union. Loyalty marketing firms like Aimia are focusing on using mobile payment to incentivize brand loyalty and customer retention. In 2012, brands will find new ways to manage customer relationships by tying payments to mobile devices using new technologies like Square and NFC (near field communications). Touchscreens have defined our experience of mobile devices — first on smartphones, and now on tablets. In 2012, Microsoft will finally launch its first Windows operating system with a touch interface built into it from the ground up. After years of telling your kids to stop touching your computer screen (it’s not an iPhone, dear! ), you won’t have to, as your screen will seamlessly switch back and forth between mouse, keyboard, and touch. The emergence of another transformative interface, voice-driven computing, was first seen this year in IBM’s Watson, the Jeopardy-playing artificial intelligence (A.I.) computer. Consumers got their first voice A.I. interface to take home in Siri, the personal assistant in the Apple iPhone 4S. Expect voice interfaces to appear in more consumer digital experiences starting in 2012. Multi-screen TV viewing is rapidly becoming the norm. 42 percent of Americans surf the Web while watching TV, and 26 percent send instant messages or texts. In the last Super Bowl, Twitter users sent a record-breaking 4,000 messages each second. YouTube’s integration with Google+ will allow for simultaneous social viewing of online video, not just television. Brand advertisers will need to think about how to engage customers across these multiple social screens. They may want to look to Bravo TV, who found that its online viewing parties gave a 10 percent ratings lift for the “Real Housewives” series. Recorded video has already become a huge business opportunity, as testified by the many YouTube channels for brands like Home Depot, IBM, and Pepsi. By contrast, live video interaction (like Skype and FaceTime) has been seen as a consumer conversation tool. But it is now emerging as a powerful platform for conducting business. Not just teleconferences, but medical consultations, therapy, and even cooking classes are now being conducted via live video. The Hangouts feature on Google+ will further popularize this by making group video incredibly easy. Look for brands in 2012 to find new ways to use live video conversation to engage key audiences. Social couponing will likely decline in 2012 for three reasons. Many Groupon competitors have pulled out (including Facebook Deals); investors are showing wariness about the business model; and local retail partners are growing increasingly wary. A recent study showed that customer reviews (as measured on Yelp) decline significantly after a retailer launches a Groupon deal. In another kind of “social commerce”: Facebook’s dreams of becoming a huge e-commerce platform to rival Amazon will likely not come to fruition in 2012. Facebook brings social sharing but not much else to the table (it can’t handle fulfillment, or customer complaints, or inventory), and it keeps too much of customers’ data for itself. Merchants will find they can do better by advertising their wares within Facebook apps, and encouraging customers to share their purchases on social media, but keeping the actual e-commerce transactions on their own websites. In 2012, marketers will warily watch the web’s three titans fiddle with the rules of their respective kingdoms. The first to watch is still search giant Google. Brands will need to carefully track how the integration of Google’s products (especially Search, YouTube, Maps, and Google+) begins to impact the rules of the game for SEO and customer engagement in 2012. Will brands need to spend more time on Google +1′s and Hangouts, as part of ensuring that their web presence stays high in Google’s search algorithm? Facebook is next. As brands still wait for the roll-out of Timeline, we can expect that Facebook will continue to play with its algorithm for what gets shown to consumers in 2012. On the plus side, this may lead to less visual spam for the user and higher click-through rates on Facebook’s vast but underperforming inventory of banner ads. On the down side, marketers may find they have to pay more and more just to get their content seen by their own Facebook “fans,” let alone spread virally to others. Finally, Twitter will continue to experiment with its interface and its advertising products in 2012. Its addition of brand pages this month is a welcome step, and it adds a bit of polish for users visiting a business account via a web browser (but this is only a small portion of Twitter’s traffic). The real question for 2012 is what new advertising products Twitter will develop (like the new Promoted Trends) that will give marketers more visibility in front of the right Twitter users, while ensuring that what users see is relevant enough to keep them engaged with the service. To gTLD or to Not gTLD? If you haven’t already heard, there’s a new word in town. It’s called “dotBrand” and it’s about to crack the dotcom world wide open. In January 2012, the Internet Corporation for Assigned Names and Numbers (ICANN), the non-profit organization that governs the internet’s naming system, is opening the opportunity for global businesses, communities, governments, and even geographical locations, to apply for generic top-level domain names (gTLDs)—such as .canon, .wine, and .nyc. Many are now weighing the pros and cons of “dotBranding” themselves. Like all things, there are a wide range of considerations to factor in when deciding whether to apply, among them trademark protection, brand equity, and cost. To help business leaders evaluate the benefits of investing in a gTLD, Columbia Business School’s Center on Global Brand Leadership hosted a video webinar, “Who Should Invest in a dotBrand?” this fall. The event brought together branding and internet experts to discuss the strategic questions decision-makers are facing. To view this free webinar, click here. First, it should be clarified that ICANN isn’t simply handing out gTLDs to the first person or organization that applies. Just because Jane in Arizona is applying for .madonna doesn’t mean that she’ll get it. There are “checks and balances” in place including a trademark clearinghouse providing authentication of trademark information, and an objection-based process enabling rights holders to demonstrate that a proposed gTLD would infringe their legal rights. Of course there are valid concerns for businesses, organizations, and communities who do have common or even similar names. A company like Patagonia may be legitimately concerned about securing the same domain name as the region of Patagonia. ICANN has created a dispute resolution program, and even auction procedures, to handle such issues. 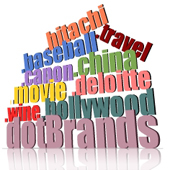 While some brands perceive gTLDs as a risk and may be considering applying for trademark protection, others envision possibilities involving brand extension and brand architecture. For example, a parent company like Unilever with multiple sub-brands could employ “dove.unilever.” B2C businesses like Citibank could create a more personalized consumer experience through their websites with url’s such as “www.michael.citibank.” But this also begs the question about the appearance of a brand’s homepage—is it “home.bmw” or “bmw.bmw”? Brand consultants seem to still be hashing this out. And many opponents to the new gTLD program feel the financial commitment is a hefty price to pay for a top-level domain system that they feel works fine with its 22 existing TLDs (.com, .gov, .jobs, etc.). The application costs US$185,000 as well as a reported US$25,000 annual fee. Then there are the additional expenses such as technical, administration, and maintenance fees. For big name brands, this could be worth the investment. When compared to the cost of a single, 30-second television spot, it’s not a huge chunk of change. For small to mid-size companies, however, it is an expensive endeavor that may take deeper consideration. The application process may be preempted, however, as the U.S. Senate Committee on Commerce, Science, and Transportation has called for a hearing this month to discuss the merits, implications and concerns surrounding ICANN’s new program. If the gTLD application process does move forward as planned, businesses and organizations will need to do due diligence if thinking about applying.